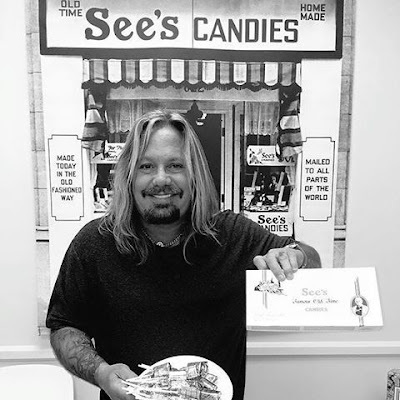 Motley Crue frontman Vince Neil has reportedly set a fundraising record while filming NBC-TV’s new season of The Celebrity Apprentice. The Las Vegas Sun reports Neil raised $200,000 for the charity Keep Memory Alive on Monday as part of a sales campaign challenge at his pop-up cupcakes and doughnut store at See’s Candy on S. La Cienega Blvd. in Los Angeles. Neil has earmarked some of the funds for the late star chef Kerry Simon’s Fight MSA Foundation at the Cleveland Clinic Lou Ruvo Center for Brain Health. The singer set an additional $100,000 fundraising goal for sales on Tuesday. Returning to NBC this fall, Neil joins the reality series now overseen by host Arnold Schwarzenegger since the network parted ways with Donald Trump last June.